Last Friday I shared with you about using oil over the top of your ferment to create a seal and I wanted to give you an update a week later. KerryAnn from CookingTF.com shared with me some things she had found about oil. I looked into it myself and found this http://www.fsis.usda.gov/Factsheets/Clostridium_botulinum/index.asp What I discovered is that botulism thrives in anaerobic conditions. So why do we not have a problem with botulism and ferments? Because they don’t survive in acidic conditions. Botulism thrives in low acid, improperly canned foods. That’s why we pressure can green beans instead of just boil process. Our ferments are acid but the oil isn’t. That is where we could run into problems. Fermentation does not affect the ph of the oil and botulism can take up residence in the oil. Eeek! This is a “could happen” scenario, not an “I’ve seen this happen” scenario. I suppose if you were extra careful to remove all the oil and even a bit of the ferment that was in contact with the oil, you would lessen the chance that this “could happen”. I do know I will not be mixing the oil in like I was at first planning nor will I be using it as a salad dressing. Better safe than sorry. So the verdict on oil… I don’t plan on continuing using it. I’m sticking with the Pickl-It Jar. 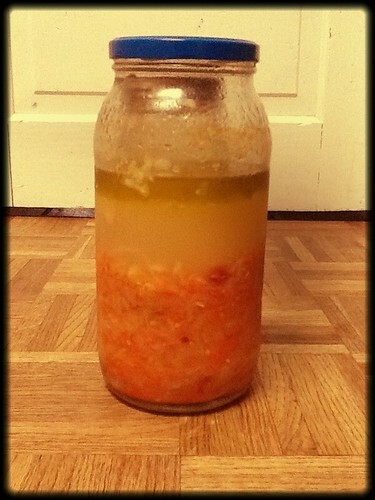 My goal for my ferments is not just a tasty treat (which is a wonderful bonus) but rather continued gut healing. We’ve come a long way in our healing journey. Kiddo #1’s doctor told us to just forget the autism diagnosis but there are still a few issues here and there. Three of us do have gut issues (one is fine and the other two I’m not sure of since they’ve always just eaten the way I do). I’m in the fermenting business to heal so it’s important to me that they contain the highest levels of lactic acid bacteria as possible and that no other undesirable bacteria are present. If you are still concerned about the cost, please read this great post by KerryAnn Invest a Little, Save a Lot. After throwing out 4 quarts of peas this last week, a quart of cauliflower the week before and multiple quarts of green beans through out the winter, I believe it! I probably could have bought a new jar with the money I spent on those veggies. ETA: To read more about this, check out Cooking Traditional Foods’ verdict. Thank you, Kelly. I feel like I’m learning so much but still have so much to learn. Who knew there was so much to fermenting?! I have to agree. I tried the oil method a couple weeks ago since I didn’t have a better system in place, and found it messy and difficult to keep the cabbage pieces down. I ended up transferring the ‘kraut after a few days and, while the oil added a nice flavor to the ferment in the end, I would not use this method again. Too much oil and too much mess/hassle. And now, the added possibility of botulism..
Oils themselves do not pose a risk for botulism. However, when vegetables, herbs or fruits are added, as in infused oils, it can become potentially unsafe. So, if there is nothing in the oil and it only comes in contact with the acidic fermenting medium it should be fine right? Yes, the oil itself isn’t a problem. Can botulism form where the oil meets the ferment? I’m not sure. I honestly don’t think the risk is that big but who knows. Using oil is more of a pain in my opinion than just using a good anaerobic jar. As such, i assume its really quite safe! I have a large 2-qt jar I am attempting to ferment a single head in. The cabbage is fully submerged and weighed down by some small mason jars. In one of the small jars I placed a mixture of baking soda and citric acid, half full of water. Then covered it quickly with cheesecloth. Then I placed a plastic lid larger than the 2-qt jar’s mouth on top and slightly weighed it down to act as a one-way vent. My theory is that the citric acid/baking soda combo releases enough carbon dioxide to create positive pressure in the jar initially, and thus forces the less dense oxygenated air out of the jar. At standard temperature and pressure (STP), air is 1.2 kg/cm3 while carbon dioxide is 1.9 kg/cm3. This should create a relatively oxygen-free gas barrier that allows the LAB’s a kickstart until they begin producing their own carbon dioxide. In theory at least…I’ll find out in a few weeks. I’m still learning here, but am very intrigued about using oil as an airlock. Does this method work well enough in lieu of having a proper airlock system right now (which I don’t)? Also, would it work for any ferment? I would certainly intend to scrape the oil, and even a bit of the ferment….I just can’t see it working with something like applesauce, or salsa…. I use oil as an airlock for fermented cabbage. Have been for years. Anything growing at the interface between oil and brine would be exposed to the brine. If growing in the oil it would need an energy source in order to produce toxin. The FDA link didn’t work, did it describe a nutrient mix from the kraut that is soluble in canola oil and sustains the botulism organism? To suppress floating bits I chop the bottom of the cabbage head to the correct size for the mason jar. It is tougher than a single leaf because of the attached core. I wedge it in the jar below the brine. Then pour oil on the brine. When the kraut heaves, I can push on the inverted cabbage bottom with a spoon and not introduce oxygen.